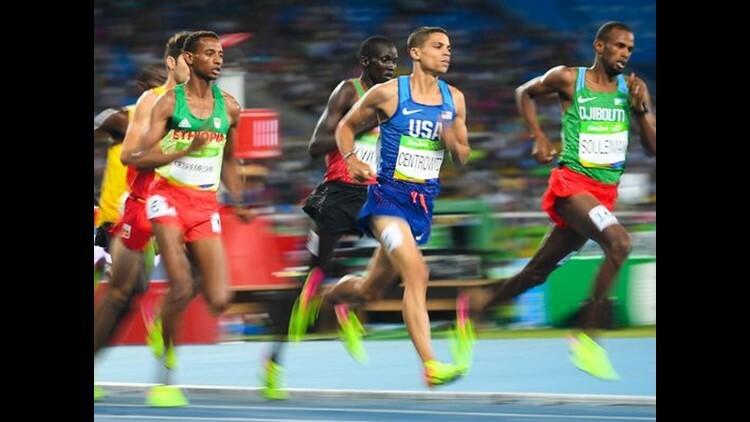 RIO DE JANEIRO — American Matthew Centrowitz scored an upset in the men's 1,500 meters, leading practically wire-to-wire to capture the first gold medal in this event for the United States in 108 years. RIO DE JANEIRO — American Matthew Centrowitz scored an upset in the men’s 1,500 meters, leading practically wire-to-wire to capture the first gold medal in this event for the United States in 108 years. Centrowitz went out to the early lead and paced the field through the first two laps. At that point, he faced challenges from several runners including Kenya’s Asbel Kiprop midway through the final lap and then a hard-charging Taoufik Makhloufi from Algeria, the defending champion, in the home stretch. But Centrowitz, a former University of Oregon star, had enough to hold in a final time of 3:50, the slowest winning time in decades. However, Centrowitz closed, after the dawdling pace, with final 400 in just over 50.6 seconds. Makhloufi held on for silver, while Nicholas Willis of New Zealand won bronze. The last American to win the men’s 1,500 was Mel Sheppard at the 1908 London Olympics.